From Barbara Bieraugel Designs, we’re thrilled to offer this follow up to Colorful Tropics: “LIFE ON THE REEF”. 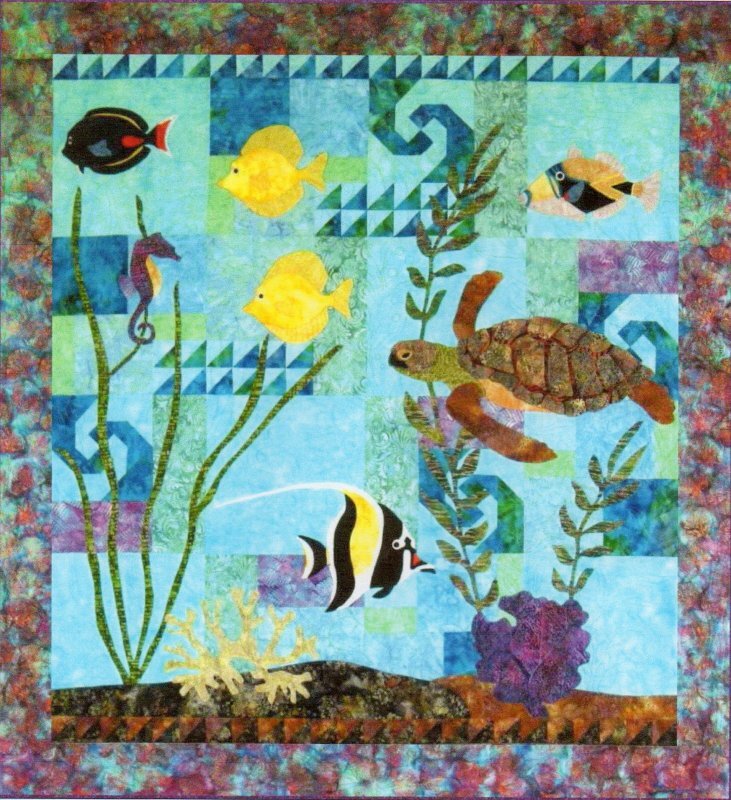 Life on the Reef is a 10-month program that results in a large (48” x 52”) wall hanging or small lap quilt. The easy patchwork background gives beautiful movement to this design. Swimming through the patchwork “reef” you’ll notice a sea turtle, Achilles Tang, Yellow Tang, Humuhumunukunukuapua’a (aka Humuhumu or the reef, rectangular, or wedge-tail triggerfish), Moorish Idol and a sea horse or a bottom of sea grass, kelp, elk horn coral and fan coral. The applique can be done with fusible or by hand – it’s your choice. Barbara’s excellent directions and tips make this an easy project to complete (even for those of us who shun the “A” word). All fabrics used in this quilt are premium batiks from Anthology and Fabrics That Care. As with all our Block of the Month (BOM) programs, there's no registration fee and no extra shipping charges - everything's included in the price shown here! You pay exactly what you see here: this 10-month program is $ 21 per month for our USA customers, $ 27 per month for our Canadian friends (to cover the additional shipping). First kits will begin shipping in mid-October 2014 and quantities are limited! Don't want to wait? The complete kit (pattern + fabrics for top & binding) can be purchased HERE.